The Literary Arts Division of the Cultural Center of the Philippines (CCP) will launch Ani 36 on April 1, 2011, 7:00 p.m. at the CCP promenade. Ani is a publication that showcases the varied literary traditions in the country and the vibrant creative writing by Filipinos in other parts of the world. 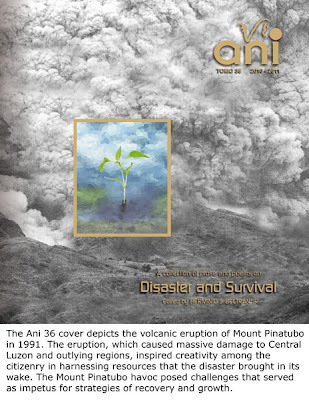 Ani 36, themed Disaster and Survival, has sections on prose, poems, children's literature, an essay on a CCP activity in response to a disaster in the regions, and art reviews. Ani 36 features the works of 43 authors namely: Angelo B. Ancheta, Rebecca T. Anonuevo, Mark Joseph Z. Arisgado, Edgar Bacong, Miguel Balboa D'Mendoza, Abdon M. Balde, Jr., Gil S. Beltran, Herminio S. Beltran, Jr., Catherine Candano, Ayn Frances dela Cruz, Jun dela Rosa, China Pearl Patria M. de Vera, Raul Esquillo Asis, Luis P. Gatmaitan, Genaro R. Gojo Cruz, Joscephine Gomez, Melanie Joy Gunio, Nestor Librano Lucena, Elyrah Loyola Salanga, Scott Magkachi Saboy, Perry C. Mangilaya, Shur C. Mangilaya, Francisco Arias Montesena, Wilhelmina S. Orozco, Will P. Ortiz, Melba Padilla Maggay, Loreli Pama, Ma. Christina Pangan, Jasmine Nikki C. Paredes, Chuckberry J. Pascual, Ferdinand Pisigan Jarin, Ian Rosales Casocot, E. San Juan, Jr., Priscilla Supnet Macansantos, Ariel S. Tabag, Christian Tablazon, Vincent Lester G. Tan, Ludwig Jan Tauro Batuigas, J.I.E. Teodoro, Enrico C. Torralba, Santiago B. Villafania, Nonon Villaluz Carandang and Bernadette Villanueva Neri. Betty Uy-Regala is the managing editor of Ani 36 while Rommel Manto did the graphic design and layout. For more details, you may contact Betty Uy-Regala at +63.906.2604175.